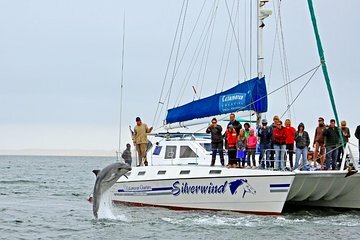 Your sightseeing day cruise begins in the harbour of Walvis Bay. You’ll hop aboard a stylish catamaran and settle into the cozy deck for a truly memorable afternoon. Enjoy the old-school saloon and take in the views as you venture out to sea. During the sightseeing cruise, you’ll gain unlimited access to some of Walvis Bay’s most prized treasures. Get up close to the submerged platforms and beds filled with these famous oysters. Then listen to an onboard expert explain how thousands of oysters are cultivated here each year. Set sail to Pelican Point, a quiet peninsula where you can catch these colorful winged birds flying overhead. Take in the impressive view, complete with scenic lighthouse and ocean landscapes. Cape fur seals may even be gathered on sandy shores. Next, head to Bird Island, an artificial inlet that’s home to numerous colonies of seabirds. While at sea, scope the waters for three different species of dolphins: the Atlantic bottlenose, dusky, and the heaviside. With a little luck, these friendly mammals with find their way to your catamaran and join in the fun for at least part of your excursion. During whale season (July-August), Southern right whales, orcas or humpbacks may also be in the bay. Hard to spot sunfish and leatherback turtles are a few of the other marine life worth looking out for while adrift. After working up an appetite, sip sparkling wine alongside everything from Walvis Bay oysters — farmed in the waters around you — to tasty snacks, canapés and cocktail cakes. Wash them all down with a water, beer, juice or a coffee or tea. Then, sit back and enjoy the view as your day cruise comes to a close and you head back to port to leave your catamaran. Excellent guide and staff. Served drinks and snacks of a high quality. Animal and nature interaction phenomenal. Fantastic trip and very much recommended. Wonderful experience at sea! Life animals on the boat! very good food and Vonkelwijn on the boat - more than we expected! It was in fact a very pleasant Cruise at Walvis Bay. Everything is very well organised: We had this trip in a very nice Catamaran, the excursion team, starting from the Office desk to the seals feeder and the Tour guide was very friendly and well prepared and the light buffet served at the boat was delicious. I do recommend this trip. It is a Must! But be aware of the weather: it is always windy and frozen there. So, you better take your warmest jacket with you!